“Commit your way to the LORD, trust also in Him, and He shall bring it to pass” (Ps.37:5). I thank God for granting me the opportunity and the privilege of giving my Christian testimony and glorying, in utmost humility, in what GOD, in his eternal love, has willed to do for me, in me and through me. I come from a Christian Greek Orthodox family. My parents raised us with moral principles. Both of them had never, however, made a “personal acquaintance” with Christ and with His saving grace. This is the reason why they tried to transmit us their moral principles and certain Christian traditional manners and customs. After more or less seventeen years of married life, their marriage broke, they divorced and got remarried. Despite their divorce and their new respective partners, we their children, three boys and a girl, remained for both of them the object of their love and care. Their separation has left deep and indelible bruises in us. Similarly, the periods of the Greek-Italian war, followed by the harsh German occupation and then by the civil war have left profound and indelible bruises in my soul of child and young adolescent. Some years after they divorced, my father came to know the Lord. The first thing he did was to try to bring us, his children, to Christ. He used to invite us to the Free Evangelical Church. My soul was challenged and charmed by God’s truth and I was finally converted to Christ. Now, I would like to relate, in broad outline, how Ι was converted to Christ and speak about the main landmarks of my spiritual walk, without, however, following a chronological order. At the time when my father used to invite us to the Free Evangelical Church of Athens, the man who preached was called Constantine Metallinos, Dr. of Mathematics and Director of the Ministry of Finance. He was a genuine man of God. God used him during the fifty years of his spiritual ministry for the conversion of hundreds of people and for planting, in cooperation with his precious collaborators, many other Churches all over Greece. The simple and clear way he preached aroused in me the keen desire to read the Bible. As I was reading it, I realized that, though I thought I was a Christian, I was not simply an unbeliever but also an atheist! Desiring to be sincere with myself and at the same time wanting to find out the truth, I began to read carefully the Bible and at the same time some books against Christianity and other apologetic books against the positions of those who deny Jesus as the Messiah. An arduous investigation started and lasted more than six months. That research was so intense that I began to neglect my university studies, in the Agricultural Faculty of the University of Thessalonica, to the point of risking losing one year of studies! As I was reading the Bible, I was stunned by the numerous references to the prophecies which were accomplished in Christ’s life and in the life of the people of Israel. What led me to faith and salvation was the Messianic prophecies! My faith was finally based on them: Men of God, some of them kings, others priests, others shepherds etc., having lived at different places and different centuries, moved by the Holy Spirit, prophesied during a period of one thousand years about the life and ministry of Jesus Christ with amazing details, concerning His miraculous birth, the place of His birth, his life, His words, His works and miracles, His crucifixion, His burial, His resurrection, His ascension etc. Those prophecies were accomplished both in Christ’s life as well as in the life and walk of the people of Israel through the centuries!!! The apostle Peter exhorted believers to take heed to the word of prophecy: “For we have not followed cunningly devised fables, when we made known to you the power and coming of our Lord Jesus Christ, but were eyewitnesses of his majesty. For he received from God the Father honor and glory, when there came such a voice to him from the excellent glory, This is my beloved Son, in whom I am well pleased. And this voice which came from heaven we heard, when we were with him in the holy mount. We have also a more sure word of prophecy; whereunto you do well that you take heed, as to a light that shines in a dark place, until the day dawn, and the day star arise in your hearts” (2Pet.1:16-19). Pascal called the prophecies as the permanent miracles of God! 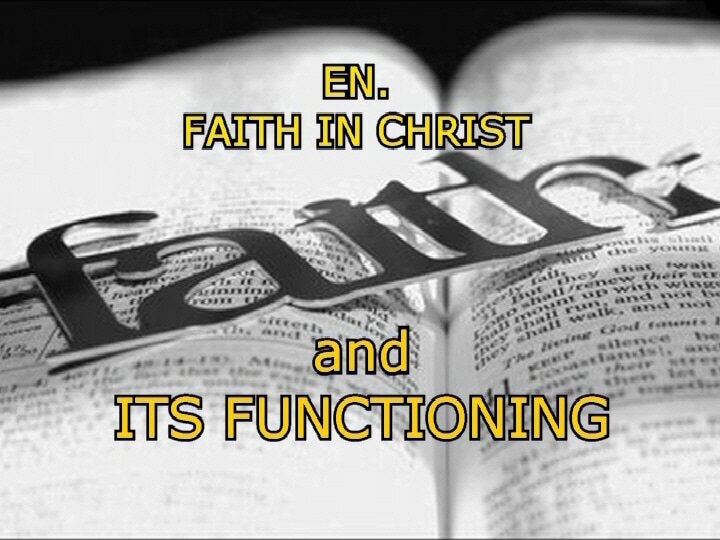 My main difficulty was focused on accepting the authenticity of the Bible from the historic point of view and the resurrection of Christ because it is written: “And if Christ be not risen, then is our preaching vain, and your faith is also vain.” […] “And if Christ be not raised, your faith is vain; ye are yet in your sins” (1Cor.15:14, 17). When I was finally persuaded of the historic authenticity of the Bible, based on historic proofs, and the resurrection of Jesus, my soul was seized by admiration, awe, and fear and trembling! The historical proofs, coupled with the sincerity of a man of good will, helped me to seize the object of faith, which is Jesus Himself. My researches were transformed in certainties… I realized that it took more “faith”… to be a silly unbeliever and an atheist than to be a serious believer. Then, I fell on my knees and asked God for the forgiveness of my sins and for the salvation of my soul. That event took place beginning November 1952. Sometime later, I gave my testimony at a Church in Thessalonica, where I was continuing my university studies. I did it spontaneously being pushed by the desire to proclaim what God had done in my life and especially what was the inward change that had taken place in me. God, without my knowing, had led my soul to salvation through the most Biblical ways: Through the prophecies, the faith in the miracles of the birth and resurrection of Jesus Christ, the faith in the forgiving and purifying power of the blood of Jesus Christ and as well as through my confession of faith before God and men. Since then, I know that I am just a sinner saved by the precious blood of Jesus Christ shed for me on the cross of Calvary, but a sinner who hates and avoids all sin and who is also a child of God by adoption. From now on and in the future, heir of God and co-heir of Christ, by God’s mercy and grace! “Beloved, now are we the sons of God, and it does not yet appear what we shall be: but we know that, when he shall appear, we shall be like him; for we shall see him as he is” (1John 3:2). Alleluia! The assurance of my salvation entered my heart and the proof of my conversion and salvation followed. My life, my whole life was changed. Darkness was replaced by light; sin went out, pure life came in. The Bible verses, Romans 10:9, 10 had been completely realized: “That if you shall confess with your mouth the Lord Jesus, and shall believe in your heart that God has raised him from the dead, you shall be saved. For with the heart man believes to righteousness; and with the mouth confession is made to salvation…” Since then He is my Savior and the LORD of my life! The fact that I had begun my spiritual life from zero and from atheism and the fact that in order to believe I had made a diligent research for answering all my questions and beliefs, had armed me with powerful intellectual, apologetic ammunitions. I could, therefore, help others in the same way I was helped to find the way to salvation. A few days after my conversion, my best friend was converted to Christ through my witnessing. It must, however, be emphasized that his conversion would never have taken place if my friend did not love the truth and if the Holy Spirit had not worked in our hearts! I open exceptionally a relatively detailed parenthesis concerning the conversion of my friend. I open it because of its importance and because it triggered my evangelistic work that followed: When he saw the radical change in my life and of my beliefs, he started to make fun of me and call me “crazy”! One day, I asked him in a serious manner the question: “Do you believe that I am an idiot or that I am ‘crazy’?” He replied: “No, on the contrary! But how can an intelligent and reasonable man believe such things?” Then, I had the opportunity to explain to him how I became “crazy”! My friend became serious… After a few days we met and he said to me: “From the day that you spoke to me about your experience, I cannot have the peace of mind and I keep thinking of you and your experience with God. Every time I am with my girlfriend, I speak to her of your change! The problem is that she is also perplexed…”. This confession on the part of my friend put such a burden on my heart that I could not take care of my studies! One afternoon I did not go to class, but I went to the sea to the wharf in the port of Thessaloniki, where sometimes the passengers disembarked (stairs), in order for me to concentrate and pray for him. My soul was in state of… ‘agony’… At a certain moment a thought flashed in my spirit: “Does God want them to be saved? Do they want to be saved? You, do you want them to be saved?” My response was: “Of course”! “Well, then it is finished!” My soul was no longer in agony! One or two hours after this agonizing state, as it was too late to go to the university, I headed to the church for the Wednesday evening meeting. To my amazement, I saw the young couple in the Church yard! Both exclaimed with joy: “We have accepted Jesus Christ in our lives”. From my eyes flowed continuously tears of joy!!! Since then, they are a Christian couple, faithful and well founded in the faith! The Lord has rendered them pillars in their church! Also, since then, I have been so encouraged that I began to evangelize any person that I knew or I did not know!!! Thirteen months had gone by this way in the new life in Christ. My life was changed. God had taken from me the heavy burden of sin and guilt and had put on me the light burden to remember that my sin and guilt were “forgotten”, thanks to Christ’s sacrifice. I had the impression that I was not walking but I had wings and was flying. Salvation was my new song. God’s saving grace was my permanent testimony. It was almost impossible for someone to stay with me for a few minutes without being evangelized… I was very happy. My only desire was to make other people happy through God’s mercy and His saving grace! Despite my spiritual progress inwardly, which was manifested in my everyday life outwardly, there was a kind of sorrow in my heart… I felt that I was still weak, not being always able to resist temptations and my weaknesses, that I had not enough spiritual power and capability to understand easily God’s Word, discern His will and to serve Him efficiently. I was not always able to do what I wanted. I often did silly things because of my exceeding zeal and lack of wisdom! I was, therefore, thirsty for spiritual power, for maturity and for spiritual fruitfulness. Sometimes, I confided my blunders and my spiritual thirst to some believers, elders in the faith. Neither the efforts of other Christians to comfort me by telling me “but it’s normal”, or “we are feeble and fragile human beings”, or “we have Jesus who forgives us our sins”, etc., neither my spiritual progress up in those days, nor the souls that were converted through my witnessing, among which my mother and my sister, could satisfy and console my heart. I was convinced, according to the Bible, that there was something more for me. Now, as I look back, I see that God was preparing me through that “spiritual lack of satisfaction and thirst” for a higher stage of spiritual life. Having identified my problem, I gave up everything I had in order to keep and cherish a pure heart and a good conscience coupled with a sincere faith towards God! It was then for the very first time that I understood that the Bible verses Romans 12:1-2 are intended for believers. I found out that these words are addressed to brothers in Christ! They read as follows: “I beseech you therefore, brethren, by the mercies of God, that ye present your bodies a living sacrifice, holy, acceptable unto God, which is your reasonable service. And be not conformed to this world: but be ye transformed by the renewing of your mind, that ye may prove what is good, and acceptable, and perfect, will of God.” Another verse of the Bible that the Holy Spirit used to encourage me to take that step of faith was the following: “His lord said to him, Well done, you good and faithful servant: you have been faithful over a few things, I will make you ruler over many things: enter you into the joy of your lord (Mat.25:21). I was convinced that it would be the “sine qua non” condition for me, if I wanted to be continually renewed in my inner self and make real progress in my spiritual life. In reality, without realizing it, I responded positively to the requirement of Jesus Christ to renounce myself, to take my cross and follow Him… (Luke 14:27; Mat.10:38; 16:24; Mark 8:34). That day of my consecration was for me the most glorious day of my defeat that I can never forget! That exuberant and unspeakable joy that lasted for several days has been transformed, with the passing of the years, into a permanent, deep and holy optimism as well as into a profound love for the Word of God. The light that was shed in my spirit, coupled with a daily study of His Word, has been transformed into a source of power and a solemn seriousness as well as into an ability of using efficiently His Word according to the needs and circumstances. I know that He gave me a new name which “… no man knows saving he that receives it” (Rev.2:17b). I was rejoicing and I rejoice at His Word, as one that finds great spoil (Ps.119:162). Then, immediately, I woke up. I understood that it was a solemn message from the Lord, through a dream, for lifetime, that is, that during all my life there would be no possibility for me to take the helm of my life and guide it according to my will or judgment, but that the wind of the Spirit of God would always lead me to good harbors! It was a confirmation from the Lord related to the principle of His love, of His providence, of His Lordship and of His plans of peace for me and not of evil, to give me the expected end, even without my knowing, but as well as my incapacity to govern my life… A confirmation that was given to me in a particular and personal way! My incapacity to govern my life was confirmed to me, as the time went by, by many Bible verses, but mainly by a verse that I will mention later! When I look back on my past life, I, John, the little old man, (I am in my 85th year of my life), I cannot but visualize the accomplishment of that prophetic dream… All I was asked to do was to WAIT PATIENTLY, FAITHFULLY AND SILENTLY for the outcome of God’s doings… No helm, but security! Therefore, nothing for which I could ever glory and boast! God has been exceedingly merciful to me: He did not permit to happen to me the disaster I was afraid of. On the contrary, He honored me and lifted me in very high posts… without any pursuit or intervention from my part! Besides that, HE filled my life with successes and spiritual and material blessings, but… also testings and tribulations I could not imagine! After my conversion to Christ, a verse became the most important of my Christian walk: “Commit your way to the LORD, trust also in Him, and He shall bring it to pass”. “[…] for whatever is not of faith (conviction) is sin” (Rom.14:23). In other words, I told Him: Wiling or unwilling, bring me to your will! Is this a passive behavior? No, not at all! It is God’s fear in my heart, the faith in His words and my confidence in His character IN ACTION! Nevertheless, when I am convinced that it is the Lord who calls me to say or to do something, then the doubts and the fear disappear and I become strong, very strong: “… the righteous are bold as a lion” (Pr.28:1). When the certainty enters into my heart, then I become patient, calm, firm and energetic. It is a sin to act without having the ‘green light’ from the Lord, from His written Word. I repeat: Paul said to the Romans: “… whatever is not from faith (from conviction) is sin” (Rom.14:23). In general, when God’s Word says: “Commit your works to the LORD, and your thoughts will be established” (Pr.16:3), it does not mean that men should be inactive and lazy, doing nothing and leaving all to be done by the Lord. No, they must be assiduous and hard-working, they must look for God’s guidance and must ask for strength and for help to do their duty, persist and depend on Him for success. Whatever your hand finds to do, do it with your might… (Eccl.9:10). In other words: Do your part with His guidance and God will do what He has promised: Everything that will be for your good but also for His glory. The Lord will do for us what we cannot do… The man, who waits patiently to receive from God’s hand what He would judge good to ‘send’ him, whether prosperity or adversity, has already won the spiritual battle and has given to God the honor that belongs to Him. It is an act of humility that drives man to obedience and to reward from on High. Man must commit, by fervent prayer, his problems to God’s good will and must wait for a blessed outcome from His path. “How precious also are Your thoughts to me, O God! How great is the sum of them!” (Ps.139:17). As for me, have I always been successful? No! It is, nevertheless, my conviction, my decision to entrust my problem to the Lord and leave Him act… The LORD will perfect that which concerns me (Ps.138:8). If I seek first the kingdom of God and His righteousness He will take care of everything concerning me (Mat.6:33)! I have no confidence in me. I depend on Him. I prefer that the Lord chose for me the manner and the time… When the Lord gives me ‘the green light’, then I begin to collaborate with him actively following the instructions of the Holy Spirit! In other words: When I see clearly in the Bible what I must do, I act immediately, walking, however, with circumspection in my steps, “Because to every purpose there is time and judgment… (and way – GR)”, much more because I know that ‘My times are in His hands’ (Ps.31:15a et Eccl.8:6). These last words are absolutely true! It is not enough to know what to do, but we need to know how to do it… In the epistle of James it is written: “Therefore to him that knows to do good, and does it not, to him it is sin” (Jas.4:17). Even in this word, there is the “what” and the “how”! Therefore, one must be praying for all things and act with wisdom! I have been driving a car for 65 years. Each time that I go out in my car I ask the Lord for His protection. The fact that I have asked for His protection, this does not mean that I can drive recklessly. Of course, according to the cases and the circumstances, God’s Spirit reminds me certain promises or principles of the Bible that illuminate my mind and encourage me. When the people of Israel came out of the country of Egypt, the Lord told the Israelites: “Yet there shall be a space between you and it (the ark), about two thousand cubits by measure. Do not come near it, that you may know the way by which you must go, for you have not passed this way before” (Jos.3:4). It means that I must follow ‘the ark’ and not to precede it, not to go before it… It means, in reality, that it is necessary to discern the voice of the Lord before acting: “Ponder the path of your feet, and let all your ways be established” (Prov.4:26). Every day, every instant, is a new experience, a new test, a path in which I must walk, in reality, for the first time… The Bible says: “That You should visit him every morning, and test him every moment” (Job 7:18). Then, prudence in word and act, dependence and fear of God! “It is a snare to a man rashly to say, It is hallowed, and after vows to make inquiry” (Darby) (Pr.20:25). Yes! “The plans of the diligent lead surely to plenty, but those of everyone who is hasty surely to poverty” (Pr.21:5). Unfortunately, I have acted in certain cases hastily and reaped the consequences! I do not, however, lose courage! When I want to see the solution immediately and in my way, then the Lord reminds me something that He taught me when I was still young: “John, if your watch is broken, you entrust it to the watchmaker. Do you remain at the watchmaker’s to show him what is necessary to be done? If you bother him with your impatience, he is going to return it to you and he will show you the door… Why do you permit your arrogant impatience to stop Me from taking care of your problem? Don’t you trust Me? If yes, let Me act!” In Psalm 106 there is a phrase that has greatly edified me: “… They did not wait for His counsel” (v. 13). The same spirit is in the verse: “It is good that a man should both hope and quietly wait for the salvation of the LORD” (Lam.3:26). A very short parenthesis: I have known in my life many people who were much more prudent than me, but their prudence concerned their own interests and not God’s glory. This prudence is useful from man’s viewpoint, but it does not contribute to man’s salvation… and to God’s glory. May the Lord open their eyes and may they learn the fear of the Lord, so that they become wise and consider their end (De.32:29) and not their material interests. Why not commit all to Him and trust Him and let Him act? The same verse which is at the center of my spiritual walk made me understand something else very important: The Lord will not act for me, He will not give me what my heart desires, if I do not trust Him, if I do not practice the good and if I do not live in faithfulness. Yes, if I do not make God my delight or if my heart is not aligned to His will! In other words: He will not act in my favor if I do not commit my way and myself to God!!! Complete surrender ! His love is always there so that I can go boldly to the throne of grace, that I may obtain mercy and find grace, to be helped in time of need (Heb.4:16). That event of the 7th of January 1954 has marked my life: Strength against sin, wisdom and spiritual understanding, building up of a spiritual character as well as strength in my witnessing bringing forth fruits of conversions of souls and edification of others. These were the fruits of God’s gracious visitation to me from that day. I saw in my life the accomplishment of those verses in 1John 2:20, 27 which say: “But you have an unction from the Holy One, and you know all things. […] But the anointing which you have received of him stays in you, and you need not that any man teach you: but as the same anointing teaches you of all things, and is truth, and is no lie, and even as it has taught you, you shall abide in him », as well as verse 1John 2:14: “[…] because you are strong, and the word of God stays in you, and you have overcome the wicked one”. I will never forget that day of my victorious defeat! God also blessed me by healing my body! Since the beginning of my academic studies I suffered a nervous breakdown because of the exaggeration that I made in studying my courses! At the same time, I was involved too much in my sporting activities. Yet, I must humbly confess that the main cause was that I was a too anxious man… I fell in the hands of doctors because of my foolishness ! I had used all kinds of tranquilizers which existed at that time, but it was in vain. At the end they proposed me to undergo electroshocks, something that I rejected immediately! One day, after my conversion to Christ and, if my memory is correct, shortly after the day of my complete surrender to God, I read during my daily meditation of the Bible the verses: “Trust in the LORD with all your heart; and lean not to your own understanding. In all your ways acknowledge him, and he shall direct your paths. Be not wise in your own eyes: fear the LORD, and depart from evil. It shall be health to your navel (nerves – GR), and marrow to your bones” (Pr.3:5-8). This word touched my heart! Health to my nerves? … To my nerves? Yes! Why not? Knowing well that the Word of God is absolutely reliable, my soul relied on it and all my being rested. I threw all my drugs, but in the first place my anxious character, and in a period of three months, my health was restored! This step of faith has in reality become “health for my nerves”!!! While I could not read or write more than half an hour, I could now work with my studies and papers many hours occasionally up to eighteen or twenty hours per day! The Lord knows that I am telling the truth without exaggeration! (Note: This does not mean that I am against medicines or medical doctors… It depends on the case). In fact, I had the first encounter of Xenia in the framework of youth Bible studies. I had come to Athens to visit our parents, because I was studying in Thessalonica. I was impressed by Xenia’s interventions, full of wisdom and spiritual discernment, and I wanted to learn more. Incredible but true! All things were prepared and organized by our Father in heaven and were carried out on earth with the presence and assistance of the Holy Spirit, in an unthinkable and unbelievable manner! She, at that time, was working as a typist at a lawyer’s office and I was expecting to be released from the Greek army where I was serving as a reservist officer. I was also expecting to be recruited by the Ministry of Agriculture as an Agronomist. Four days after I was released from the army we got married on the 25th of December 1956! A simple celebration, but worthy of two children of God! After our marriage, trials, coupled with God’s wonderful promises and blessings that followed, were but a confirmation and coronation of God’s decision to unite our lives. What was most extraordinary in our lives was the unity of spirit in pursuing our spiritual goals and aspirations from the beginning of our life up to the end! In certain cases, we differed from each other concerning the means and ways to achieve our common targets, but the differences of opinion contributed either actively or passively to our common and mutual edification and to our spiritual growth. She loved the purity of heart and the truth with her whole being! She was so charitable, that I had to put from time to time some limits, in order not to be found in the need that others do charity toward us! She was also a woman of prayer! Of prayer without ceasing! Her Christian character was full of righteousness, of sincerity, of a deep love for piety. She also was extremely hospitable! Her deep faith in the Word of God had inspired her a profound optimism, which would never accept to be defeated by the Devil. I mention below certain events which illustrate this point. First of all I want to just mention a truly amazing act of her faith, of her courage and of her prophetic vision! From the first moments of the hostilities in the Six-Day War, she wrote a letter to Golda Meir, which I immediately handed to the Israeli Embassy in Athens. In that letter she encouraged Mrs Meir by declaring, on the basis of certain Bible verses, that Israel would defeat the Arab countries which had attacked the country. Then she sent her a poem! She received a thank response from Golda Meir! Then she continued to have occasionally a correspondence with the first two Prime Ministers of the State after her. Her letters were full of words of encouragement! Since then she wrote and sent poems on Israel… Here, in Brussels, she continued to have relations with the Israeli Embassy. Her love for Israel as well as her desire since her young age, led her to write or rather to complete the eschatological book “The Little Horn and the North” (A Bible Study on the Antichrist and the Rapture of the Church). This book and her poems for Israel are included in my web page. In addition to all I have already mentioned I want to add that God had given her a gift of an author and of a poet which have been revealed and accomplished during the last thirty years of her life! All her works are published or posted in my Web page: http://wordstaughtbythespirit.com. God gave me, in her person and her intense spiritual personality, a perfect gift! It is also true that we made a lot of mistakes, both of us! Most of them due to an excessive zeal or to a lack of experience and discernment! Our common goal was unique: The work of God, and the glory of our Lord Jesus Christ, our Savior, Who tries our hearts (1Thess.2:4), to Whom we shall give account and Who is ready to judge the quick and the dead (1Pet.4:5). We were, however, sure that He would deliver us from every evil work, and would preserve us to his heavenly kingdom! (2Tim.4:18). My wife Xenia, when she was still young, fell seriously ill during the end of the years 50 and at the beginning of years 60. This happened a year or so after our wedding! She had a heart attack. One of the reasons was that three of our four parents deceased in less than a year. She was bedridden for about 7 years approximately. Her health situation was constantly worsening. There was nothing encouraging to the horizon except a number of precious promises of the Word of God, which maintained us spiritually and physically alive: In the multitude of our anxious thoughts within us His comforts were delighting our soul (Ps.94:19). That is how we lived! The valor of her faith was incredible! She never expressed complaints, never murmurings; she was never mad at God for her illness. On the contrary, while she was still ill, she accepted the idea of death in order to do God’s will! This decision was honored by God and He restored not only her health but He also gave her three beautiful girls! This experience would be difficult to believe if it was described in detail! The test of my wife’s illness was tough, very tough, but the peace, the joy, and the love that God had placed in our hearts have made the hardships bearable. We were often perplexed, not knowing the mystery of His will, but we knew well that it was He who had gracious plans for us (Eph.1:9), and Who made all things to contribute for our good because we loved Him sincerely (Rom.8:28). When I look back, my heart is filled with wonder and gratitude for His blessings and for the path by which he has led us to. He taught us for our own good! Then I began to cheer, as Joseph, the patriarch, that God had increased us spiritually and materially in the ‘land of our affliction’ (Gen.41:52). God, despite the tough trials that we went through, made us “… prisoners of hope” (Zech.9:12). During the illness of my wife or rather during the last year of her illness, not being able even to read the Bible, she asked me to do something so that she would not be bored alone all day long in the hotel room where we lived. (We lived then at Tripoli where I worked as an agronomist in the Directorate of Agriculture in the prefecture of Arcadia). It seemed to me appropriate therefore to record the New Testament. For more information on what followed after this first effort I will talk about it in more detail later. Early after my new life in Christ, God spoke deep into my heart through the words, which were addressed to Ezekiel 3:1b in a specific way which can neither be explained, nor described: “… eat this roll, and go speak unto the house of Israel”. My spiritual progress became soon manifest to the Christian communities. The call to the work of God came for the first time ever and even suddenly when a young American missionary asked me to cooperate with him in order to create a Bible Institute. I refused because I had to leave my work at the Department of Agriculture and also because that ministry “did not speak to my heart”. A few weeks later a Greek-American pastor proposed to me to be the interpreter, on Sunday mornings and Wednesday evenings, for an American pastor who was going to replace him, something that I accepted. After a year, the new pastor left for the United States for almost a year and he charged me to assume the responsibility of the church. After his return, the various churches of Athens began to invite me as a speaker, having seen that the Holy Spirit had given me the gift of preacher and teacher of the Bible. At the beginning, it appeared as if it was men who called me to the work of God, just to help them, but later I understood that it was God who had entrusted it to me! The churches assigned me the responsibility and gave me the privilege to preach and teach the Word of God as one of the regular workers of the Free Evangelical Churches of Greece for more than fifteen years. Given that my spirit was always open to the Bible, and cooperative with various “denominations”, a number of other Churches of different denominations, Pentecostal and Presbyterian, wanted to use me as one of their speakers. During that period I saw people converted and others being edified. Μy spiritual ministry was interrupted abruptly in September 1976, when the Government assigned me to Brussels, as the agricultural counselor to the Greek Permanent Representation and gave me the status of a diplomat for the negotiations of the accession of my country to the European Communities ! I consider it necessary to mention for the glory of God, what God did to me, in His grace, in my professional career before my assignment to Brussels in September 1976! I worked the first ten years of my professional life in the prefectures of Viotia, Preveza and Arcadia. Wherever I went I evangelized young and old, highly placed people and the men on the street. I became the target of priests, teachers and the police. In the city of Thebes I was judged for ‘proselytism’ but was acquitted. A big dossier was, however, created against me in the Central Service of the Ministry of Agriculture. What is strange and wonderful is that despite all the so called evidence against me for ‘proselytizing’’ I was sent to Italy and France for postgraduate studies in agricultural economics and regional development. God had chosen for me the specialization which would prepare me for my future career! With the change of Government in 1981, when the Minister of Agriculture came to participate to the first Council of Ministers of Agriculture, he visited me in my office and told me that they were well informed that I was not in Brussels by political means. He wanted me, however, to return to Athens in order to help them because of my experience and that he would give me the best Department. I thanked him and I asked, as it was legitimate and reasonable, to return to Greece after two to three months so that I could vacate the house according to the rules of the country where I lived and have the time to prepare to move to Athens. In the meantime, my three daughters would have the time to finish their school year in the European School. He found my request reasonable and legitimate and agreed. Nevertheless, after a week, I received a letter by which I was ordered to return immediately to Athens!!! How to vacate my apartment without any warning to my landlord, what would happen to the guarantee I had paid for the apartment and above all, how to cut my kids from their studies at the end of the school year? Then my wife turned to me and said: “The Devil chases us away from here. Here we have to stay and here we will win!” This word of faith touched my heart! Finally, our position led us to an unprecedented victory in all areas. I returned to Greece, because I had to, and my family stayed here in Brussels for our children to continue their studies. We endured for three and a half years, me and my family, a series of humiliating persecutions and an indescribable poverty. Too often my family had no means to buy even plain bread! But here we won… The fighting spirit for the truth and the spiritual discernment and perspicacity of my wife was really worthy of admiration! Indeed, I was transferred to Athens and instead of giving me the post of a director, as it should be done according to the promise of the Minister himself, I was assigned as Head of Division of International Relations despite the fact that he knew well that I was not a member of any political party! The Minister asked through one of my subordinates that the decisions of my Division be taken according to a majority rule!!! I, as head of Division, should execute the decisions taken by my collaborators, as if my Division was a Parliament. They had to decide according to the majority rule in my stead! Of course, that was something that I could not accept! He could not transform me into one of his pawns because I could see their lies and their “iniquities”. Despite their rage against me they sent me to Rome to claim the re-election of Greece in the context of the FAO although Greece had not the right to be re-elected! My intervention, which began with a verse from the Bible, very relevant to this international convention, as well as the respectful and friendly relations that I had established with many of the participants at this Convention during the previous years within the framework of the international organizations, produced the desired result! My speech was applauded and Greece was re-elected! So, the new Government could boast! Despite all this, the government continued the harsh and humiliating persecutions for three and a half years. Toward the end of this period, they wanted to send me to the borders of the northern Greece to make agro economic studies! Finally, not being any longer able to work under this government for reasons of Christian conscience and simple professional dignity, I decided to resign, even with a reduced and devalued pension. It was then that I submitted my resignation and I came back to Belgium to join my family. God, however, was again good to me. On my return to Brussels, the Commission offered me a temporary work. At the beginning as a consultant under contract and later as a civil servant, because of their appreciation for me! Behind all this it was, in reality, God’s favor! During the three and a half years that I remained in Greece, my salary was greatly diminished because of the devaluation of the drachma and I was significantly in debt in order to meet the needs of my family. Thanks to this temporary work in Brussels, I could pay back with a very great difficulty my private creditors and the capital that I owed to the bank. The Bank – incredible but true –even sent me a letter by which they thanked me for my great efforts for the reimbursement of my debt faithfully! By the same letter they released me from the obligation to repay the interests which exceeded one hundred thousand Belgian francs! God intervened in many other ways during this period that I do not judge necessary to describe here. Perhaps someone could say: What relationship is there between my spiritual testimony and my professional adventures? And yet! It is in this way that the Lord acted in my life and His name was glorified. His Name was sanctified in our hearts and was honored in our environment! A few months later, I prepared all the appropriate documents for the unemployment fund and went to submit them to the competent Service. The officer started to examine them in detail to see if everything was in order and exclaimed: “But you have the right to a pension”. Then I turned to him and I said to him: “But have you not been telling me for more than three years that I have no right?” He answered: “Yes, but I did not know that you are over the age of 60 years! You are entitled to 10% of your salary before leaving the service…” I took back my papers and went back to my office. From my eyes flowed constantly tears! Tears not for the small pension of 10%, but tears of gratitude to my heavenly Father who knew my need and had answered my prayer! And if that was not enough, after a year, while I was getting two small pensions both from the Commission and from Greece they suggested me, as I was a relatively high degree civil servant, to ask for the fusion of my two small pensions. A year later, the fusion of my Greek pension was approved by the Greek competent Service. I was called by the competent service of the Commission in order to present me the economic terms of that fusion. The competent official told me that if I accepted the fusion, my pension would be fixed automatically to the maximum allowed, that is at 70% of my last salary to the Commission and would be accompanied by a whole series of other privileges, retroactively for some of them. When he announced all that, I was with my daughter Lydia, in order to have her opinion. We watched each other stunned and silent! I asked the Commission official to repeat for a second time that option! Then I replied that I would accept it… I remained mute of surprise and admiration for the plans of God! When we got out of his office and while we were walking, I did not rub my hands for the money that I was going to cash in, but I cried with sobs of gratitude to my heavenly Father for his faithfulness… The Greek politicians had meant evil against me, but ‘God meant it to good, to bring to pass’… (Gen.50:20). My “tomorrows”, as my “yesterday”, also belong to Him and are secure. That is why I mentioned my professional adventures! I have never put my hands to organize, to obtain goods and glory, although I always rejoice when the good name accompanies my life and my testimony in Christ. I never loved money. I worked with faithfulness and with patience wherever I went! I have loved the truth, that is why I have been persecuted by certain politicians, by some churches and by some religious associations although I had served with an extreme faithfulness! God closed doors and God opened them! (Apo.3:8). You are going to tell me that I am boasting… Yes! I am boasting! Yes, I am glorifying with the deepest humility in the Lord: I never said that I saved myself, but that it is HE who saved me. I never said that I have succeeded and have accomplished something in my life, but it is HE who succeeded all for me. A lot of people told me and tell me that I am a strong man, but I knew that I was and that I am a deeply a weak man, easy prey to clever exploiters on account of my sentimental character. One day, my Lord told it to me, it is HE who confirmed this to me that I have “little power”! Yes, but I am very strong with His Word and His power. With His TRUTH! “Thus said the LORD, Let not the wise man glory in his wisdom, neither let the mighty man glory in his might, let not the rich man glory in his riches: But let him that glories glory in this, that he understands and knows me, that I am the LORD which exercise loving kindness, judgment, and righteousness, in the earth: for in these things I delight, said the LORD” (Jer 9:24). IF I ever wanted to brag personally for something, it would be that in the hours of crisis I made good choices with His help and encouragement! Difficult and painful decisions! As I have already mentioned earlier, my wife Xenia, when she was still young, got seriously ill towards the end of the 50’s and the beginning of the 60’s, for about 6 or 7 years. Not being able even to read, she asked me to do something so that she does not get bored all day long, being alone, in the hotel room. (We stayed at that time in Tripoli, Southern Greece, where I used to work as an agronomist at the Agriculture Department, in the district of Arcadia). I judged, therefore, good to record the New Testament. Unfortunately, the recording was not of good quality because it was recorded in a small and improper place of the hotel! Later, when I was transferred to Athens, in the Central Service of the Ministry of Agriculture, we stayed in a relatively quiet apartment. There, I started again the recording of the whole Bible of the Greek Bible Society (the Vamvas version). This work took about three and a half years, with two hours of work every day at dawn before going to the office. It was used exclusively by our family. As time went by, I found out that it was a very good recording, almost professional. I wanted to put it out free to the public. In vain! There was no response! In light of the impasse and of lack of interest I thought good to cooperate with an American Publishing Company. There were, however, in that case a lot of obstacles and I gave up the project. The audio recording remained, therefore, unused by the public. It was used only by our family for several years. It was in the 90’s, after several trials and efforts, I was able to convert the 10 reels of 1800 feet in 76 audio tapes, which would give a new breath of life to this work… Unfortunately, this new effort remained without effects for several more years. In the meantime an American brother in Christ offered me towards the end of the ‘80s the New Testament in English on floppy disks, as have already mentioned. This “gift” triggered in me the strong desire to do the same work in Greek for the entire Bible. I went, therefore, and bought from Budapest, Hungary, the OCR program for the Greek language (because only there it could be found, those years) and I started the work of the conversion of the Holy Bible, and in collaboration with the “Online Bible”, Canada. This work took overall about four years. If I had not had the precious help of Athanasios Karabasis, the son of my friend and brother in Christ, George Karabasis, that project could not be realized. I produced three versions: The Polytoniki or Multiaccent (MGreek), the Monotoniki or Single Accent (MGreekM) and the Without Accents (MGreekU). This work was limited to the written versions of the Bible in Greek. In 2003, during one of my travels to Thessalonica, to visit my childhood friend George and his wife Sofia, I met Angelos Margaritis, the grandson of my friend George. Being informed of my problem, or better of my strong desire to share this work free to everyone who might be interested, he expressed his will to convert the 76 audio-cassettes into CD or better into mp3 CD. He produced them at his own expenses and distributed them free by the hundreds! Then, he converted them into DVD players. Later, he used the written version Monotoniki in order to add to each written verse the corresponding verse from my recorded version, and by adding to them a background of beautiful pictures transformed them into slideshows. Chapter after chapter, verse after verse, and page after page all enumerated. In almost all his efforts, he was helped by his uncle Athanasios Karabasis, who is an IT expert. Finally, with endless hours of work, great efforts and under most difficult financial situations, he produced on the basis of the slideshows the edition www.GodTube.gr (video). (This version presents some slight sound problems at the end of a few chapters, which will be corrected in due course). By God’s grace, he produced an excellent work and without any payment from me. The mp3 CD’s and the two DVD’s for the entire Bible give the possibility to hear, to see and enjoy beautiful pictures with the possibility to choose any of the books of the Bible. These Bible editions as well as certain other versions which were modified by Sporeas.gr and Newlife4you, based on my original recording, are already included in my web site. Each of them has its own precious features. Everyone can find the differences concerning their special functionalities which appear under the headings THE BIBLE IN GREEK and THE GREEK BIBLE IN VIDEO. What matters is that the Word of the Lord may have free course and be glorified (2Thess.3:1)! I am and will always be grateful to them! So, I have found that, after nearly forty (40) years (! ), the written version of the Bible combined with the audio version has also been valued by other Christian organizations with some nice changes and very useful presentations! A lot of tears of joy and gratitude to God flowed from my eyes, when I saw that after almost 40 years, these works have begun to contribute to the expansion of the Word of the Lord through the Internet to the ends of the earth!!! Yes, to the ends of the earth! Heaven and earth will pass away, but the words of the Lord Jesus Christ will never pass away (Mat.24:35)!Finally, I consider it necessary to add that the brother in Christ Costas Stergiou included the Multiaccent version together with the Monotonic, which was already included in the excellent site theWord.net where the Bible is offered free in many other languages! God has entrusted me with the sending of spiritual messages and studies. When the Government sent me to Brussels in 1976, as the agricultural advisor for the accession of my country to the European Communities, the intense spiritual ministry, that I had in Athens as a lay preacher for several years, ceased. The only thing that I could do, in reality, was for me to serve during 28 years in the distribution of the Bible in the context of The Gideons International Association. The flame, however, that burned in me for the work of evangelization of unbelievers and especially in the edification of believers was blocked. I was in Belgium, in a hospitable country, but in a foreign country, and I was a stranger among strangers! I was praying, therefore, waiting patiently to see other opportunities and especially under the guidance of the Lord. God opened my eyes to see that my deep desire could be realized by sending my spiritual messages and studies via the Internet. Some brothers helped me at the beginning to find email addressees. God put the seal of His approval and the positive responses arrive almost every day from my recipients who use this spiritual material in several ways. Angelos MARGARITIS, George ECONOMIDIS and George KANTARTZIS respectively, for their faithful cooperation, encouragement as well as the wonderful improvements they made, not only concerning the Bible, but also concerning the publication of all my spiritual messages and studies as well for the books of my wife. I thank also all those who, during the years, have worked faithfully and behind the scenes for the revision of my texts. God bless them and bless His work for the salvation of souls and the edification of believers. In closing, I would like to add that the whole thing is due to the power and grace of God who gave his Son Jesus Christ for our sins and raised Him up for our justification. To Him belongs ALL the Glory! The forgiveness of my sins and my purification from them – in the sense also of my deliverance from them – are due to the precious blood of Jesus Christ who loved me and offered Himself as an eternal sacrifice. He is the Alfa and the Omega of my salvation, because I was unable to justify myself and much more to be set free from my weaknesses and passions. What has marked my life and for which I am really thankful to God is the act of obedience, which He helped me to do by surrendering myself to Him, not only in words but also in practice. He helped me to trust myself in Him as a Guarantor of my spiritual development. I am more than convinced that if that choice to live always in a state of good conscience had not taken place, I would be – spiritually speaking – a lamentable soul, having always the feeling of living for myself and not for HIM, Who had redeemed me and to Whom I completely belong. When I was not careful or obedient enough, He never stopped wanting to lead me in the way I should have taken… and through which He is passing me now, again and again, because I have not been able to learn the lesson that my heavenly Father was trying to teach me in the past. HE INSISTS! HE does not want to leave His work incomplete! Every time that occurred to me to lose my way or my courage, the only way I could ever find it again was to turn my eyes back to the cross of our Lord Jesus Christ, through which the world has been crucified and I to the world (Gal 6:14). All my life, up to date, has been a repetition of the following procedure. I have never been able to seize the helm of my life and obtain what I desired to do by my own “intelligence” and efforts (Jer.10:23). God was blowing on the sails of my little boat which was carried away by the events of His divine Providence! He has given me what was good and profitable, but different of what I imagined as well for me. He gave me, as a rule, more than I expected and desired – without efforts from my part. I cannot boast of the blessings that I have received and that I enjoy. HE holds the keys of my life! When HE opens the door nobody can close it, and when HE closes it all my efforts are vain and nobody can help me or save me (Rev.3:8). In closing, I want to emphasize the mercy of God, which removed my sin and the grace of God which added my salvation. In addition, He gave me spiritual gifts and His favor that accompanied and accompanies my life, just as he does in the life of every true Christian. Everything I did and everything I am are due to Jesus Christ’s love and to His amazing grace! The fact that He has consented to write my name in the book of life constitutes the most precious gift God has given me. This is the reason why I have never repented of my choice to follow my Savior Jesus Christ, my Lord and my God. God has consented to write my name in His Book not because of my good works, but because I have believed in Jesus Christ sincerely, I have loved Him sincerely and I have followed Him faithfully (John 6:47). If my life and my ministry have been fruitful, this does not belong to me or to my relatives to judge, but to the Lord. What counts is that I have always followed Jesus Christ with love with all my heart, sincerely and faithfully. If He says to me, “It is, well, good and faithful servant…” that would be my ultimate reward! This would also mean that as a useless servant, I have done everything that I have been ordered!